2m long cable used to connect the Codman ICP EXPRESS to any ADInstruments bridge amplifier. Cable for connecting PowerLabs to a computer. A packet of ten DIN connectors (8 pin) with metal twist-lock ring. An earth cable with POAG connector suitable for use with the earth connection terminal on the rear panel of any PowerLab. Stimulating electrodes are available in platinum or stainless steel with a variety of ring diameters. Single and double rings available. For use with 4, 8 or 16 Chamber Organ Bath Systems. Oxygen Membrane Kits that are suitable for use with Oxygen Microelectrodes. 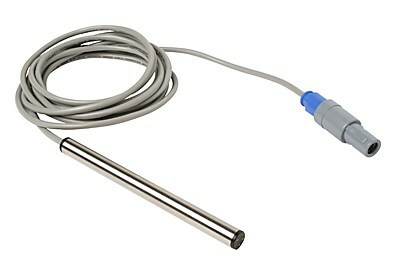 Connects the Physiological Pressure Transducer to any ADInstruments Bridge Amp with DIN input connectors. These microelectrode holders are available for use with the AC/DC Differential Amplifier (AM3000H), which has a headstage designed for use with glass pipette microelectrodes holders. The MagStim Interface Cable is used for connecting the Isolated Interface of a MagStim 2002 stimulator to any PowerLab with a Trigger input option. A pack of five 2 mm uninsulated jacks. Connects the Douglas bag to the Gas Analyzer with the Modified Tubing Adapter. This is a high impedance headstage that can be taped directly to the skin of a human subject. Cables and connectors for recording wireless neural activity in freely moving rodents. Used for student experiments using the freshwater alga, Chara corallina. Set of two heating coils, each with a 220 mL capacity. For use with Panlab Organ Baths.